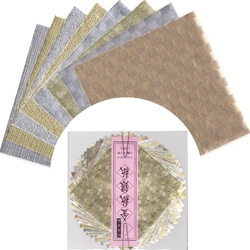 The Kin Gin Embossed Foil Origami Paper Pack features 16 sheets of foil origami in 3 metallic colors. Each pack contains 4 sheets of gold, 4 sheets of copper and 8 sheets of silver. The sheets are embossed to create a unique texture that catches and reflects light. From honeycomb to checkerboard and polka-dot to orange peel, these unique Japanese foil origami papers will mesmerize you. Each 3.75" sheet of foil is embossed with an intricate light catching pattern. The Kin Gin Foil Origami paper acts like traditional foil, but brings real texture and pattern to you origami sculpture. Unlike smooth foil origami paper, these embossed foils resist showing fingerprints and smudges. Each pack contains 4 sheets of gold, 4 sheets of copper, and 8 sheets of silver Kin Gin Origami Foils. Coordinate your Kin Gin sculpture with 3" gold foil or 3" silver foil origami papers.